Office closed every other Friday. The City of Shasta Lake contracts with the Sheriff's Office to protect citizens and property within the City of Shasta Lake. Our local Deputies focus on safeguarding the public and contributing to the quality of life within the community. 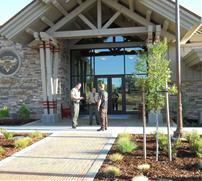 The Shasta Lake Station is comprised of 1 Lieutenant, 2 Sergeants, 10 Deputies, 1 Community Service Officer and 2 Cadets. Together, these officers cover the residential and commercial areas inside the City of Shasta Lake. The main goal of the Sheriff's Office is to create and maintain a safe, secure environment for all Shasta Lake citizens. We strive to accomplish this goal through preventing crime, enforcing laws, and maintaining order.